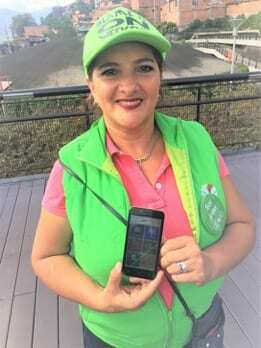 Informal advisor (Ia) Adriana in Barrio San Pablo, Medellín. She is showing the free smartphone Aflore gave her, which uses the innovative MI Aflore app. Aflore comes from the infinitive aflorar, which means “to surface, to appear,” as in flowers surfacing or appearing, and Aflore is certainly doing that – helping thousands of microentrepreneurs to ‘blossom’ with their own businesses. Not only is Aflore providing microloans to people with little or no access to conventional banks in Colombia, but through a very innovative business model and smartphone technology, they are also empowering thousands of “Informal Advisors” (IAs, and in Spanish, consejeras) to reach out to their own social networks and offer loans that catalyze borrowers’ small businesses, thus helping the economic stability of their families and surrounding communities. Via its consejeras, Aflore identifies the trust and relationships which already exist within communities, and formalizes them to enable loan agreements. Aflore leans on the direct sales model and finds leaders in the community (for example, residents who have already been engaging their neighbors in home-sales of merchandise) who are then trained in Aflore’s processes, procedures, and tools to bring financial products to the underbanked. I visited Aflore at their head office in Bogotá, and then flew over to Medellín, where they opened a new branch office less than a year ago. 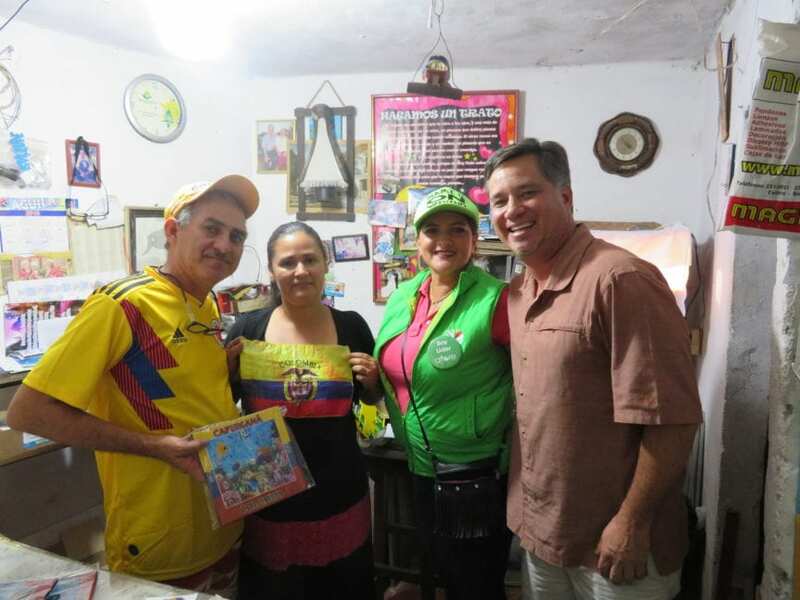 After a favorable review of the organization’s structure, strategy, systems, and in-field operations, we decided to support the Medellín project to allow Aflore to scale significantly in this new region of Colombia, and to further prove their lending concept which is already successful in Bogotá. With Whole Planet Foundation's funding, Aflore aims to reach 1,500 new microentrepreneurs in Medellín over the next three years. To me, Aflore’s model stands out as being quite unique compared to many of Whole Planet Foundation’s traditional microfinance partners, whose loan officers’ many responsibilities include identifying new loan recipients, conducting borrower meetings periodically (often weekly or biweekly), ensuring timely repayments, and even transporting cash to and from borrowers. In contrast, Aflore’s outreach strategy is similar to that of a direct-sales company – IAs are recruited, trained and incentivized to leverage their community networks, focusing mainly on identifying new clients (loan origination). Aflore then manages the network, the loans, and related analysis and risk-mitigation. This model is enabled with innovative, user-friendly technology such as the Mi Aflore phone app that is used to collect borrower information, submit loan applications, manage loan portfolios, communicate with peers and financial and tech support, etc. While ultimately the loan agreements are directly between the borrower-entrepreneur and Aflore, the IA has an incentive to find good prospective clients since she receives a commission upon securing a loan, gains points (called Florines) that she can exchange for cash or prizes such as home appliances, becomes part of a supportive peer community (also via the Mi Aflore app), and gains the satisfaction of introducing a very valuable service in her own neighborhood. Further, a consejera can also apply for and obtain a loan from Aflore herself. Consejeras also help Aflore maintain a high, on-time repayment rate, being reminded by the app a few days in advance of when her clients’ loan installments are due. As our global communities evolve and as the world’s poorest people face new challenges but also new opportunities to lift themselves out of poverty, it is encouraging to see microfinance evolving as well, through fresh, dynamic ideas which organizations such as Aflore in Colombia bring to market. by J.P. Kloninger, Americas Regional Director for Whole Planet Foundation. Learn more about how Whole Planet Foundation brings the benefits of microcredit to women entrepreneurs across South America.